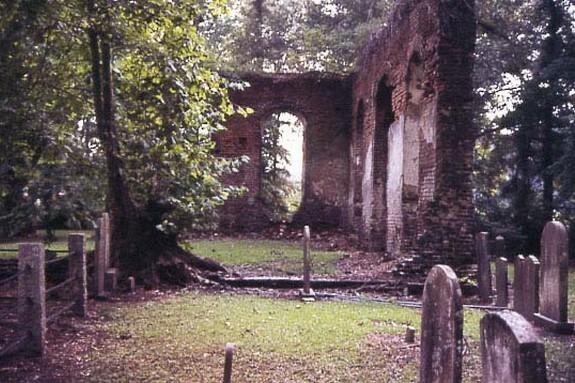 Brick ruins of former church dating back to American Revolution; was razed by British to thwart holding supplies. Old cemetery is lovely with interesting tombstones. 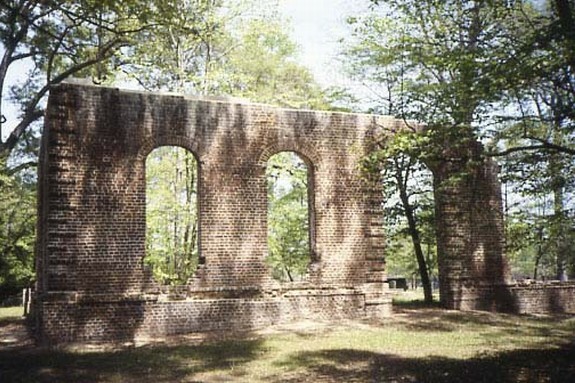 Biggin Church Ruins are the remains of the parish church of St. John’s Parish. The church was established by an act of the South Carolina Commons House of Assembly in 1706, which divided the colony into ten parishes. The original Biggin Church was probably completed ca. 1711. Biggin Church was used through the mid-nineteenth century and the surrounding cemetery is still being used. During the American Revolution, ammunitions were stored in the church by British troops who, upon leaving, set the church on fire. The church was burned several other times throughout its use, the last time in the late 1800s when it was not subsequently rebuilt. For many years the site served as a local brickyard. Although only portions of two walls remain, there is evidence that originally Biggin Church was designed with a degree of sophistication. Notable architectural details which remain include a Gibbs surround at the main portal, quoins at the corner, radiating voussoirs over the windows, and a rounded water table—all executed in brick. Listed in the National Register December 13, 1977.